Although the robin has been recorded feeding on a very wide range of food, the majority of the diet consists of invertebrates, soft fruit and seeds (3). As most of the food is taken from the ground, snowfall can cause huge numbers of deaths (3). Robins are very territorial birds throughout the year; in winter both males and females defend their own territory, and males often hold the same territory throughout their lives (3). Territories are defended by means of singing from a prominent perch, and by aggressively driving intruders away (5). During the breeding season, a female is allowed into a male's territory; she makes the cup-shaped nest of dead leaves and moss with a lining of hair (5). The nest is often located in unusual places, such as in old teapots, jacket pockets, and on shelves in buildings, as well as in more 'natural' locations such as amongst ivy (5). After the end of March, between 4 and 6 white or faintly bluish, speckled eggs are laid (7), and incubated by the female for up to 15 days. After hatching the young are fed by the female on items of food brought to the nest by the male (5). Two broods are usually produced each year, although a pair may occasionally go on to rear a third (5). 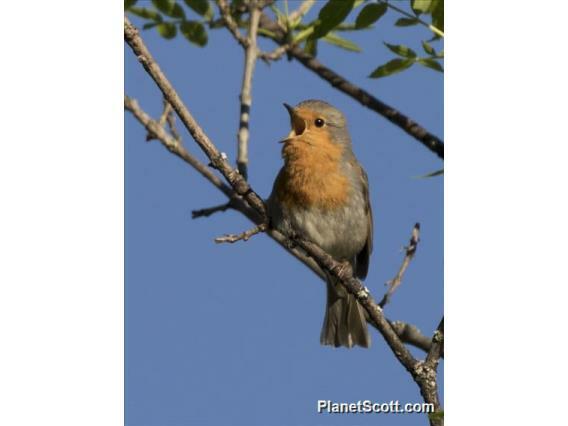 Not surprisingly, there is much folklore surrounding the robin, and it has featured in many poems and fables. Furthermore, in Britain the robin is closely associated with Christmas. The first postmen wore bright red waistcoats, and were popularly known as 'Robins'; this may explain not only why robins are often featured on Christmas cards, but also why they are frequently depicted holding a letter in the beak, delivering the mail (4).